This bike is in good/excellent condition. The bike has no paint issues and the mechanical equipment was just tuned up and in great condition. There are Brand New tires and Presta valve tubes. There are a few distinguishing things on the bike. There is a gold/yellow Spokes sticker at the base of the seat post, the pump holder is cracked and will not hold a bike pump. The seat had a small scuff on the back side near the red Trek logo. I rode to a neighbor's house to pick up my daughter, who also rode a bike, and laid the bike down in the driveway near the garage door. The kids were outside playing and came in at 9:10 pm and the bike was there. We left at 9:15pm and the bike was gone. We drove the neighborhood and I searched the bike path near the home but couldn't find the bike. There were a few cars on the street with people sitting in them and they said the saw nobody riding a bike. On 9/20/13, the Chicago Stolen Bike Registry received the following email from the victim: "I am happy to report the bike has been recovered. 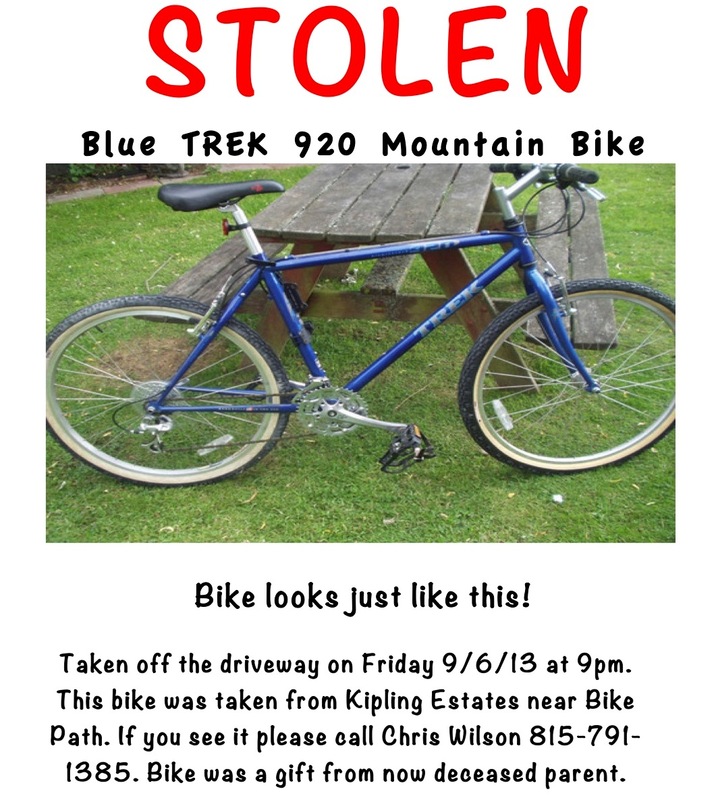 A neighbor of the kid that stole it saw the flier at the park district. She noticed that the kid had "gotten" a new bike around the time mine was stolen and went back home and looked it over. She knew it was mine and called me. The bike was almost 7 miles from home. The lady gave me the address where it was at and I headed that way. I called the PD and they showed up. I gave them the flier and they confirmed it was my bike. The kid rolled over on his friend and others that took the bike. It turns out he was "storing" it for a friend. I have numerous sightings and calls on this before the bike was finally recovered. The description of all the witnesses matched the kid that took the bike. So it was a great outcome."